The first 'Library' was in a large cupboard in the church vestibule. The cupboard Library actually lasted a long time (see below). People came large distances to borrow and change books. Library was founded in 1869 by public subscriptions. There was both fiction and non-fiction material. Chambers Encyclopaedia were also imported for the local Library in the early 1900s. Library charges were 2 shillings for adults and one shilling for 10 – 16 year olds. The local families subscribed to a weekly London newspaper 'The Graphic' which was imported. There was much excitement when the mail and newspapers arrived. The families used to take turns in reading them for one week and then passing them on. As the papers got well used and became ragged in the process the newspaper subscription was stopped. In 1908 the cupboard became too small so the land next to the church was bought. 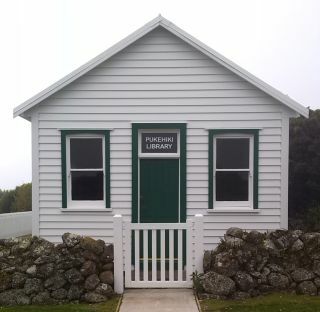 The current library was built to accommodate the expanding collections. It was called the Portobello Road Library and opened between 8.00 and 9.30pm once a week on the Saturday nearest to the full moon. According to Hardwick Knight’s book on the Peninsula there was also a Post Office in Pukehiki until 1965?? 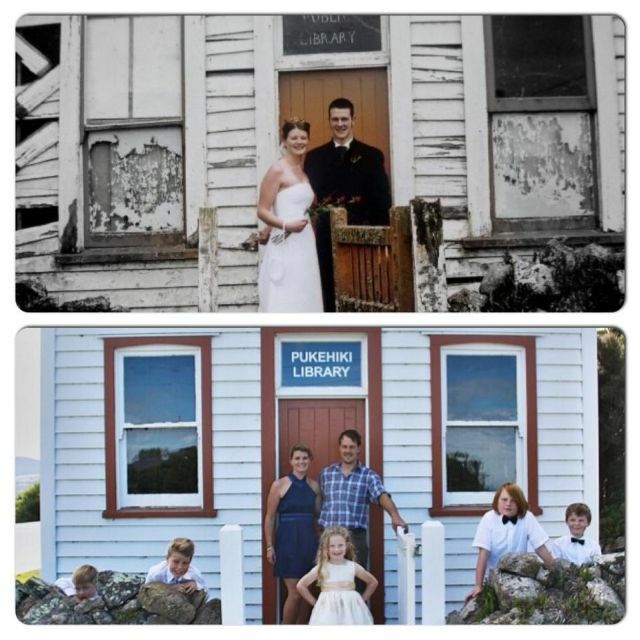 The pictures below show the degree of restoration carried out on the Library in recent years. First picture taken on the wedding of Blair and Kirstin Olsen on their wedding on 24th October 2001.